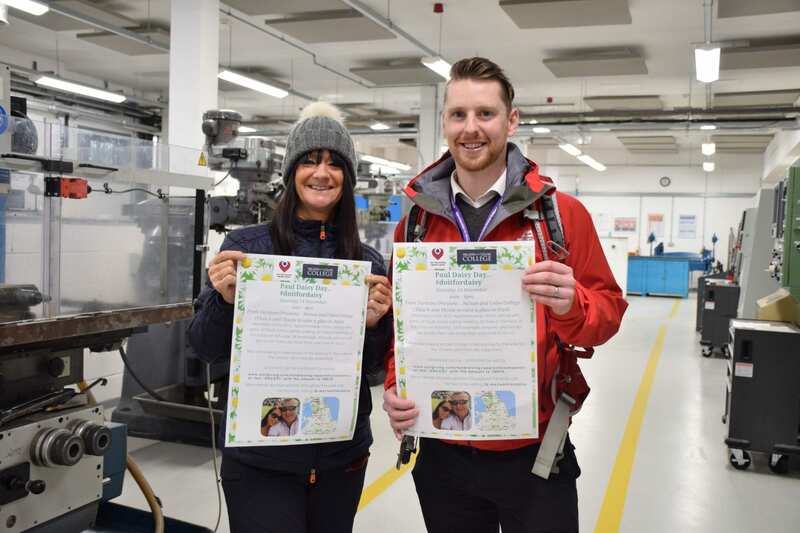 Two members of Nelson and Colne College’s Apprenticeship Team are walking the width of Lancashire on Saturday in memory of a popular colleague. Debbie Howard, the college’s Apprenticeship and Training Manager, and Dean Johnson, an Engineering Trainer Assessor, are completing the 32 mile ‘Walk for Paul’ on Saturday from Tarleton to the college in memory of Paul Day, from Barrowford. Paul, known affectionately to colleagues as Daisy, worked at Nelson and Colne College in the capacity of Programme Leader for Engineering and Work Based Learning. He died in October after a battle with cancer. Keen walkers Debbie and Dean are lacing up their boots to help raise money for Anthony Nolan and The Christie in Manchester, where Paul received treatment. The duo are also planning further charity challenges next year, including a marathon and a skydive. Debbie said: “Paul was a fantastic man who embodied courage and determination. He was a lovely, personable colleague who was a pleasure to work alongside, and what’s more, he inspired and motivated his colleagues with the enthusiasm he had for his work. “Paul remained so positive during his illness and never allowed it to hinder his brilliant work. We just want to do it for Daisy and show our support to Paul’s family at this difficult time. Paul’s wife Liz said: “I’m incredibly touched that Debbie and Dean are taking the time to walk such a distance for Paul to help raise money for such a wonderful cause in the form of The Christie. “I think Paul would think they were mad, but equally he would be extremely proud that his colleagues are so keen to raise funds for a charity that provided such superb care and support for us.